I want to share an important subject that has affected all of us in one way or another, and has negatively effected the productivity of the Muslim Ummah as a whole and individually. Something I have realized about time thieves (such as watching TV which is more harmful to the Iman than we think, notice or justify to ourselves) is that it changes us, whether slowly or quickly but surely. If you are reading Qur’an or listening to a beautiful lecture and your Iman feels high, great and pure, then shaytan tells you “hey watch a show for only a half an hour”. Thinking that there is no harm in it, you go to watch it. But it doesn’t end there. You cannot switch your Iman on and off like a light switch. You cannot do something wasteful and then expect afterwards that you will go right back to feeling the light in your heart that you did just before that 30 minute show. I am talking about shows that have been so widely spread and have become so normal in today’s society that they aren’t considered “bad”, just normal. You too may not consider it “bad” but I intend to explain why it has such a harmful effect on our productivity and Islam. People acting in such ways that are against Islam such as dating, disobeying the parents, and disrespecting spouses cause you to laugh about it, and believe that it is nothing. When you laugh about such things, you are agreeing to things that Allah hates and you are becoming more lenient to this sort of activity when it is around your daily life. This makes the Iman so low, makes us lazy and makes us lose a large amount of productivity, even though it is such a temporary joy, and there are so many wonderful replacements! You are happy the 30 minutes that the show is on, and when it is over, it’s over. So you watch another and another to try and feed false happiness. But reciting the words of Allah and reading a wonderful Islamic book, or hearing an inspiring story gives you happiness for life. You always feel full and feel light inside of you, and feel content. Keep the innocence in your life and keep feeding your Iman healthy things, don’t use your Iman as a payment for a TV show, or negative movie, because if you watch it, that’s exactly what you are doing. You are exchanging purity for dirt. It is Impossible to be completely like the Prophet and his companions and wife , if you are watching this nonsense. Save yourself and don’t risk losing your life away to a thing that will never benefit you. If you are in the mood to watch a show, ask yourself first if that show has anything in it that could lower your iman, such as bad language, inappropriate jokes, music etc. If you stop and think first if that show would please Allah or not, you have made yourself aware of it, always filter what you allow to enter your heart, because your heart is a sensitive treasure that has to be protected from harm. If you are about to sit and watch a show that you know displeases Allah , try and read just one verse from the Qur’an before you sit, see if your heart suddenly prefers to read a little more Qur’an, or watch the show. I can guess your heart will urge more for Qur’an and it will make you more aware that Allah is watching you. Think of productive things that interest you, watch a show about it, and then put it into action. Watch a cooking show, and try out a recipe, watch documentaries about other countries and make a plan to travel, gardening, sports, art, the sky is your limit. Filter out your cable channels, get rid of any show that could tempt you later, get rid of any movies in the house that should not be watched. As we know, if you repent for something and are determined to change, the first step is to get rid of the items that caused your Iman to get weak in the first place, after you have done that, turn to Allah and ask him to strengthen your heart against time wasters and that you did it purely for his sake so ask to keep you steadfast. If you do these things, I promise Insha’Allah you will see an improvement in Iman, productivity and happiness. Sadly, another thing that this Ummah has forgotten is what it means to pick up a book and read. Read inspiring stories from other Muslims and non-Muslims alike, read a book pertaining to your specific personal development, career or Islamic needs. Read a book for inspiration and boost your creativity. Reading is an activity that will engage your mind, whereas TV does not. I will leave you with a final thought InshaAllah! Just like you are what you eat (if you eat fattening foods, you become overweight and tired, eat healthy foods, you become healthy and energetic.) YOU ARE WHAT YOU WATCH. If you watch negative, wasteful shows, you become a negative, wasteful person, if you watch shows insulting religion, you become lenient in religion. Good, pure shows make you a good, pure person. It is as simple as that. Would you prefer to have ‘watched the most TV’ or ‘memorized the Qur’an’ in your lifetime? Which is more productive? 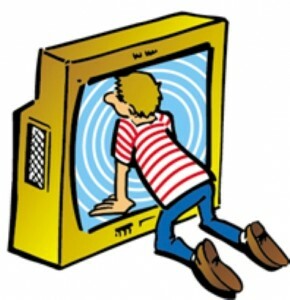 Question: What do you do to avoid the TV trap? Share with us your tips and tricks, remember no idea is too small to share! We look forward to reading your comments. Kara Regan accepted the beautiful religion of Islam in 2007, and since then she strives to do her best in developing correct Islamic knowledge through study and other means. It has become beloved to her to share her experiences with other Muslims in hopes that they better themselves through the lessons she has been blessed to learn. She has written many articles all intended to inspire and encourage fellow Muslims.